EIA expects that natural gas consumption will average 69.6 billion cubic feet per day (Bcf/d) in 2012, an increase of 2.8 Bcf/d (4.2 percent) from 2011. EIA expects that large gains in electric power use will offset declines in residential and commercial use. Because of the much-warmer-than-normal winter this year, EIA expects residential and commercial consumption to fall by 3.9 percent and 2.7 percent, respectively, in 2012, reflecting a downward revision in projected consumption from last month’s Outlook. Currently, the National Oceanic and Atmospheric Administration (NOAA) expects heating degree-days to total 4,020 for 2012, 5.3 percent less than in last month’s Outlook, and about 11 percent below the 30-year normal level. Projected consumption of natural gas in the electric power sector grows by about 16 percent in 2012, primarily driven by the increasing relative cost advantages of natural gas over coal for power generation in some regions. Consumption in the electric power sector peaks in the third quarter of 2012, at 30.6 Bcf/d, when electricity demand for air conditioning is highest. This compares with 27.7 Bcf/d in the third quarter of 2011. 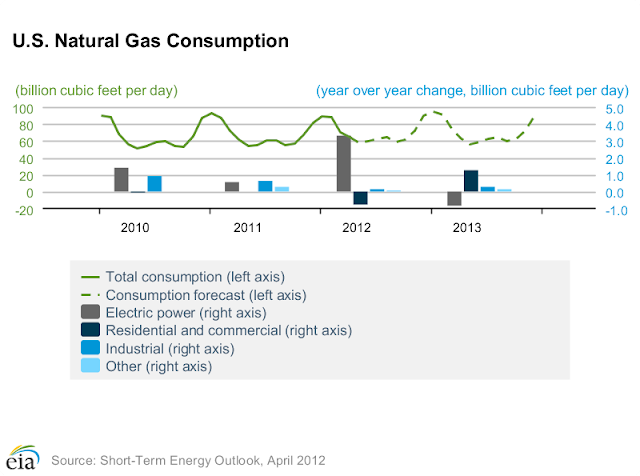 Growth in total natural gas consumption continues into 2013, with forecast consumption averaging 70.5 Bcf/d (U.S. Natural Gas Consumption Chart). A forecast of closer-to-normal winter temperatures drives increases in residential and commercial consumption of 7.3 percent and 4.7 percent, respectively. The increase in consumption in these sectors, as well as an increase in industrial consumption, more than offsets a 3.4-percent decline in power-sector natural gas burn. 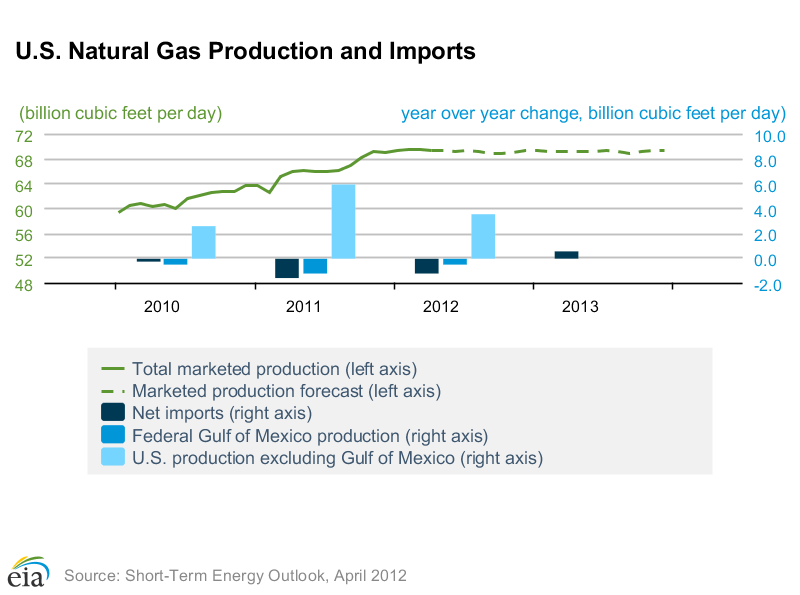 Total marketed production of natural gas grew by an estimated 4.8 Bcf/d (7.9 percent) in 2011, the largest year-over-year volumetric increase in history. This strong growth was driven in large part by increases in shale gas production. While EIA expects year-over-year production growth to continue in 2012, the projected increases occur at a much lower rate than in 2011 as low prices reduce new drilling plans. According to Baker Hughes, the natural gas rig count was 647 as of April 5, 2012, down from a 2011 high of 936 in mid-October. So far, the lower rig count has not impacted production levels, partly reflecting improved drilling efficiency. While fewer horizontal natural gas rigs, particularly in areas of dry production such as the Haynesville Shale, probably indicate declines in these areas, these losses are more than offset in the short term by other production from wet plays. Pipeline gross imports are expected to fall by 0.7 Bcf/d (7.2 percent) in 2012 as domestic supply displaces Canadian sources. The warm winter in the United States also adds to the year-over-year decline in imports, particularly to the Northeast, where imported natural gas can serve as additional supply in times of very cold weather. Pipeline gross exports grew by 1.0 Bcf/d in 2011, driven by increased exports to Mexico, and are expected to continue to grow, at a slower rate, in 2012 and 2013. Liquefied natural gas (LNG) imports are expected to fall by 0.3 Bcf/d (28 percent) in 2012. EIA expects that an average of about 0.7 Bcf/d will arrive in the United States (mainly at the Everett LNG terminal in New England and the Elba Island terminal in Georgia) in both 2012 and 2013, either to fulfill long-term contract obligations or to take advantage of temporarily high local prices due to cold snaps and disruptions. Working natural gas inventories continue to set new seasonal record highs as a very warm winter has contributed to much-lower-than-normal inventory draws. As of March 30, 2012, according to EIA’s Weekly Natural Gas Storage Report, working inventories totaled 2,479 Bcf, 887 Bcf greater than last year’s level and 934 Bcf above the 5-year (2007-2011) average. In the last 20 years, end-of-March inventories have not risen over 1,700 Bcf, and prior to that, rose above 2,100 Bcf just once, in 1983. With only a few exceptions, weekly inventory withdrawals have been smaller than the previous 5-year average during this year’s winter heating season, and though the end of March is technically the end of the heating season, net inventory injections began the week ending March 16. EIA expects that inventory levels at the end of October 2012 will set a new record high as well . 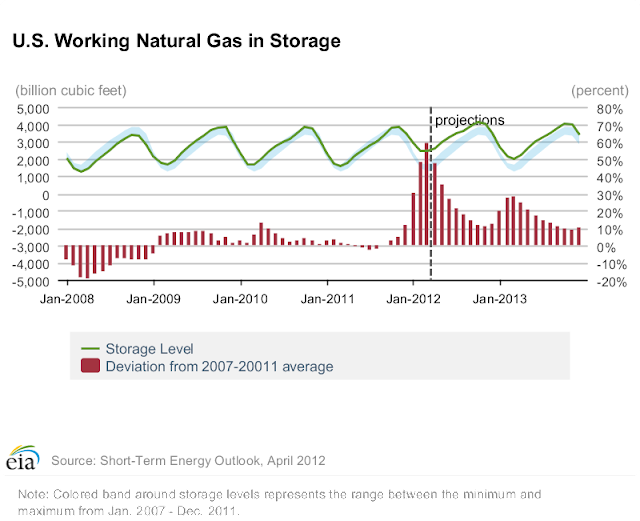 Note: Colored band around storage levels represents the range between the minimum and maximum from Jan. 2007 - Dec. 2011. 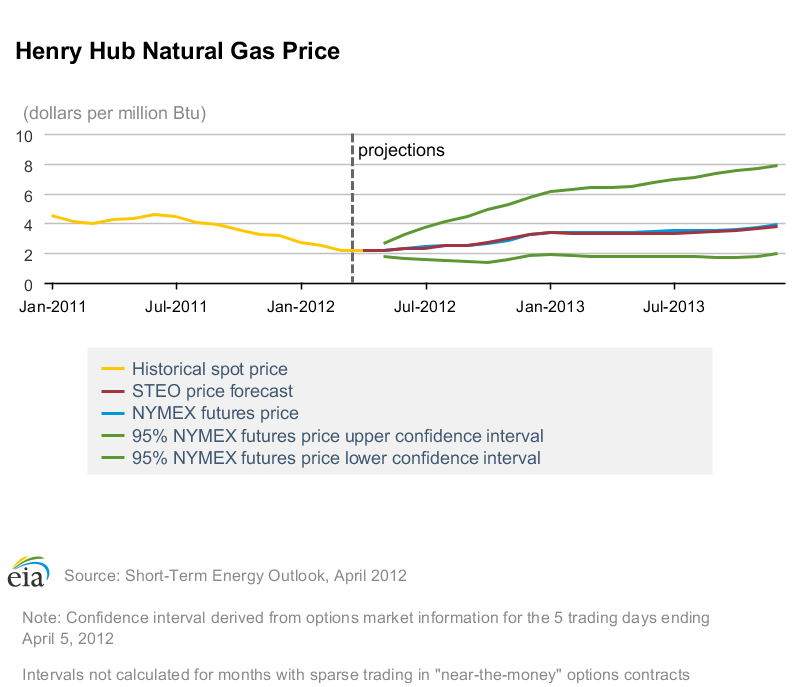 Natural gas spot prices averaged $2.18 per MMBtu at the Henry Hub in March 2012, down $0.32 per MMBtu from the February 2012 average and the lowest average monthly price since April 1999. Abundant storage levels, as well as ample production, have contributed to the recent low prices. EIA expects natural gas prices will average $2.51 per MMBtu in 2012, a downward revision from $3.17 per MMBtu expected in last month’s Outlook. EIA revised its forecast for 2013 down to $3.40 per MMBtu, from $3.96 per MMBtu in last month’s Outlook. 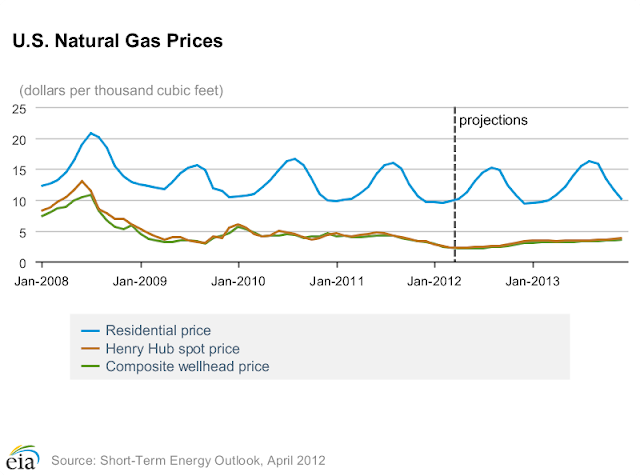 Prices remain low as production and supplies remain robust (U.S. Natural Gas Prices Chart). 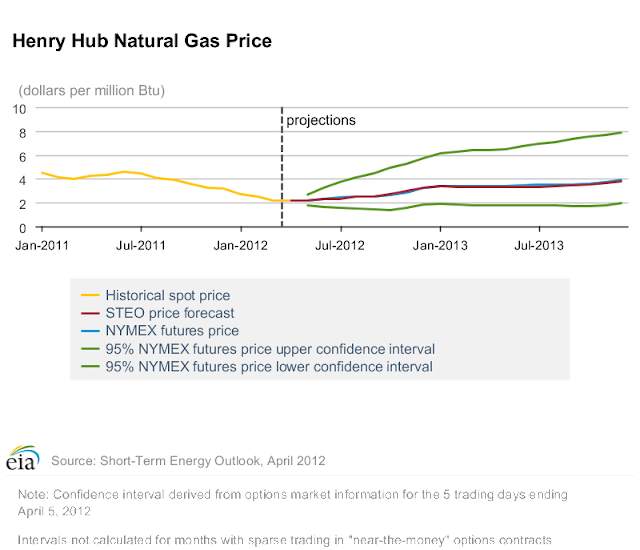 Natural gas futures prices for June 2012 delivery (for the 5-day period ending April 5, 2012) averaged $2.27 per MMBtu, and the average implied volatility based on options and futures prices was 48 percent (Market Prices and Uncertainty Report). Current options and futures prices imply that market participants place the lower and upper bounds for the 95-percent confidence interval for June 2012 contracts at $1.60 per MMBtu and $3.21 per MMBtu, respectively. At this time last year, the June 2011 natural gas futures contract averaged $4.29 per MMBtu and implied volatility averaged 34 percent. The corresponding lower and upper limits of the 95-percent confidence interval were $3.37 per MMBtu and $5.47 per MMBtu.